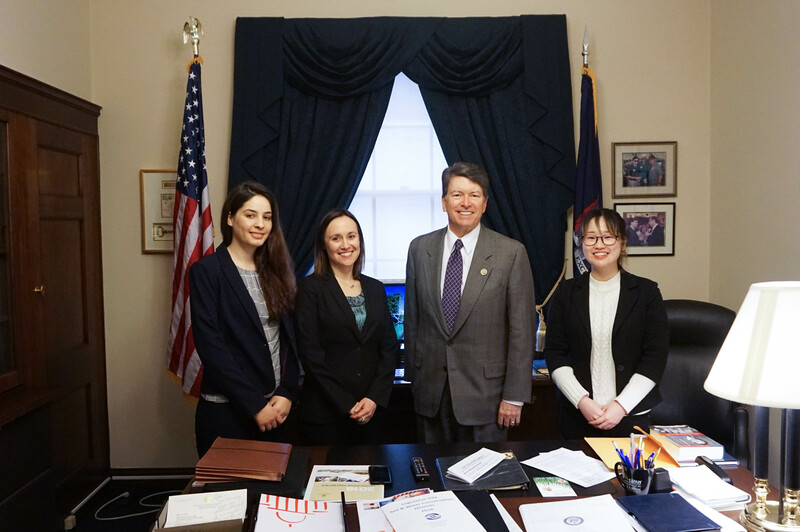 Two SUNY New Paltz students and one staff member joined more than 200 members of the NAFSA: Association of International Educators at the organization’s 2018 Advocacy Day in Washington, D.C.
Ayaka Suzuki ’18 (International Relations) and Arjeta Prenaj ’18 (International Relations) joined Cindy Cullen, coordinator for International Student Services, in representing New Paltz in meetings with Congress people and other national policymakers. SUNY New Paltz was one of eleven New York colleges and universities to take part in the NAFSA event. Students took advantage of a rare chance to meet face-to-face with elected officials, including Senators Chuck Schumer and Kirsten Gillibrand and Congressman John Faso, and to speak out for “the cultural, academic and economic benefits that international students, scholars and their families bring to the U.S.,” said Cullen. It’s an important message for many members of the SUNY New Paltz community – the College is among the top SUNY campuses in both international student enrollment and domestic student participation in study abroad – and particularly to Suzuki and Prenaj, both international students preparing for careers in international relations. In addition to her participation in NAFSA Advocacy Day, Arjeta Prenaj has studied abroad in China and enrolled in the SUNY Global Engagement Program, a for-credit experience that allows New Paltz students to work as interns at globally oriented organizations based in New York City. Ayaka Suzuki also spoke from her first-hand experience as an international student. She will join Prenaj as a Global Engagement Program alumna later this year. Visit NAFSA online for more info about the Advocacy Day event. Learn more about international student resources and study abroad opportunities at the Center for International Programs at SUNY New Paltz.